Baheya S. J. Jaber has been awarded the 2016 George N. Atiyeh Prize , given annually to a current Master of Library and Information Studies (MLIS) student to attend the Middle Eastern Librarian Association and Middle East Studies Association annual conferences as a featured guest. Jaber is an MLIS student at University of Alabama’s School of Library and Information Studies (SLIS) and a Fulbright Scholar from Ramallah, West Bank-Palestine. She received both her undergraduate degree in Finance and Banking and her Master’s degree in Business Administration from Birzeit University, Palestine. Now in her second year of the MLIS program at UA, Baheya is pursuing the thesis option, and is currently working with Dr. John Burgess , Dr. Ann Prentice, and Prof. Sybil Bullock on a critical analysis of emerging LIS trends given the realities of academic libraries located in conflict zones. Like many LIS students, Baheya’s introduction to the field of library and information began by chance, with a job at the library. Jobs are hard to find near her home, and after completing her undergraduate degree, Baheya happened upon a job opening at the Birzeit University main library’s collection development department and took it. During her time in the Birzeit University library, Baheya earned practical and professional experiences by assisting different departments within the library and participating in library related training courses and conferences. Baheya was drawn to a career in Library and Information and the interdisciplinary overlap between library studies, information technology and business management. She views these overlapping interests as opportunities to use different skills, such as communication and networking with diverse people and opportunities to learn by traveling for training programs and conferences; focusing on higher education and continued studies, and collaborating with other library specialists, students, researchers, and teachers from Birzeit University as well as national and international professionals, vendors, publishers, universities and institutions. 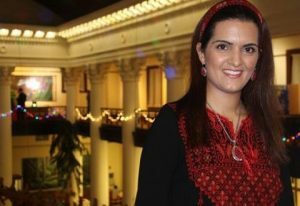 Her professional experience at Birzeit University academic library fostered a passion to pursue a Master’s degree. This passion was encouraged by library faculty at Birzeit who were aware of the pending retirement of most professional librarians in the university’s library. Baheya recognized this shortage of professional librarians as well as the lack of an LIS program in her area. She was encouraged by the library director to pursue her MLIS abroad through the Fulbright Scholars Program. After completing their degree, Fulbright scholars are required to return home to complete a two-year residency to apply their education and make a positive contribution to their field of study in their home area. Baheya was careful to choose a thesis that could be applied in her home of Palestine, as well as in neighboring countries facing similar challenges. Baheya was drawn to UA’s School of Library and Information Studies because it offers one of the top LIS programs in the US, accredited by the American Library Association (ALA). Jaber states that UA’s highly professional staff from different backgrounds provides students with an excellent advising and learning experiences. She also appreciates that UA’s MLIS program explores different areas of Library Science, which gives students flexible choices based upon their interests and career objectives. SLIS gives students the opportunity to gain applicable academic experiences such as internships, conference attendance and job opportunities, and participation in SLIS organizations.